• Full kitchen (large refrigerator, stove top, oven, sink, microwave, garbage disposal, granite counters, pass through to main room). • 18 car parking lot (shared seasonally with pool and tennis courts). Click here to view the clubhouse calendar showing current and future dates and times the facility is available. Clubhouse rental is $35 per day. A $100 security deposit and signed clubhouse rental agreement are required. 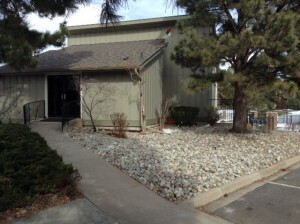 To reserve the clubhouse, arrange for a clubhouse key, obtain the rental agreement and receive complete rental details, contact clubhouse manager Deanna Mumfrey at 720 933-0785, or by email at wc3clubhouse@comcast.net. The clubhouse key must be returned no later than midnight the day of your event. You are required to clean the clubhouse after use and take away all trash. No dumpster is available. A broom, mop, vacuum, garbage bags and cleaning supplies are provided. The clubhouse will be inspected after use and your deposit could be withheld. You can decorate the clubhouse for your event as long as all decorations are removed, no marks are left, no damage is done and the clubhouse is left clean. You may prepare food or have food catered. Alcohol is allowed as long as all laws are followed, it is kept within the clubhouse and it is not sold. The pool and tennis courts are not included in the rental. Willow Creek 3 trash is picked up on Monday each week. Recycling pickup takes place every second Monday. The days in green below indicate recycling pickup dates. Click on those days for additional information. Reminder: Trash containers are not permitted to be placed on the curb prior to 5 p.m. the night before pickup. Empty containers must be retrieved by 8 p.m. the day of pickup. 6 p.m. to 8 p.m. Slattery’s Irish Pub, The Landmark, 5364 Greenwood Plaza Blvd. Snow and ice prevented this celebration last month. Join other Women’s Club members at Slattery’s Irish Pub to celebrate spring. Meet new friends in the neighborhood. RSVP to fiona_emeraldisle@yahoo.com. Sponsored by Roberta Steckler, RE/MAX Masters Millennium. To participate, email Roberta at robertasteckler@msn.com or text 303 507 6438 by April 28 with your name, address, phone, email and a list of items you may be selling. Advertising, signage and flyers provided at no cost, courtesy of Roberta Steckler. More information: 303 507 6438. 7 p.m. Willow Creek 3 clubhouse, 8091 East Phillips Circle. Monthly meeting. 6 p.m. Willow Creek 3 clubhouse, 8091 East Phillips Circle. Monthly meeting. 6 p.m. to 8 p.m. Pampered Nails & Spa, 9231 Lincoln Ave., #700, Lone Tree. Join Women’s Club members for a fun Ladies Night Out at Pampered Nails & Spa in Lone Tree. Sign up for either 6 p.m. or 7 p.m. time slots with, a maximum of 10 spots available for each time frame. Enjoy a $5 discount on services totaling $25 or more. Feel free to bring a bottle of wine, appetizer or dessert to share while meeting new friends. To RSVP, please email fiona_emeraldisle@yahoo.com. Sign up today as spots will fill up fast! Pampered Nails & Spa offers a variety of nail and waxing services. To learn more, visit http://pamperednailsspalonetree.com. 9:15 a.m. Mineral clubhouse, 8500 East Mineral Drive. Join Women’s Club members for the club's first–ever brunch bakeoff. Bring your favorite breakfast dish to share. Fun prizes will be awarded for the best hot dish, best cold dish, best baked item (breads, pastries) and best presentation. The Willow Creek Women’s Club will provide coffee and mimosas. Voting will take place for next year’s board members, plans for next year will be discussed and there will be a recap of this year’s events and financials. 5:30 p.m. Mineral Courts, 8500 East Mineral Drive. Be part of the fun and join the Willow Creek Tennis Club for this social. Weather permitting. Food and drinks provided. Adults only. 8 a.m. Willow Creek 3 pool. Dolphins versus Lifetime Lightning Bolts. 8 a.m. Willow Creek 3 pool. This championship meet is hosted by the Willow Creek 3 Dolphins youth swim team.